Makes a unique Valentine's Day decoration! Hang this sun catcher in the window and let the sun shine through! Easy kids craft made from construction paper and tissue paper. Cut 2 pieces of wax paper slightly smaller than your construction paper (or cardstock). Set aside. Holding one sheet of construction paper horizontally, center the heart pattern on top of this and trace. You need to make a rectangle with a heart shaped opening, which I'll refer to as your frame. To do this, cut out and discard the heart shape you traced in the center of your paper, without cutting the frame. Tip: An easy way to cut out a shape from the center of a piece of paper without cutting into the edge of the paper is to poke a hole with a pen or pencil inside the area to be cut out. This gives you a place to put the tip of your scissors to start cutting. Now make a second frame. To ensure that both openings line up, take the frame you prepared in step 3 and lay that on top of your second sheet of construction paper/cardstock. Once you have lined up the edges, trace inside the heart that you cut out of your first frame. Put your finished frame aside while you cut out the heart shaped center on your second piece of paper. Take one frame and using your glue stick, glue one of the pieces of wax paper to it. Your heart shaped opening is now covered by wax paper. 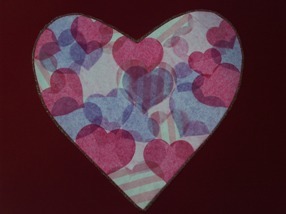 Cut heart shapes out of tissue paper. You can do this free hand with scissors, with a die cut machine, or with a heart shaped punch. Another option is to buy pre-cut tissue heart shapes which are often sold as confetti. If you prefer, you can just cut or tear the tissue into squares which will also look nice. Glue your tissue shapes to the wax paper using a glue stick. It is easies to apply the glue to the wax paper not the tissue. cover the entire opening with tissue in a collage manner, leaving no spaces and overlapping the tissue with the edge of the frame. You do not need to cover the entire wax paper, only the part where the heart opening is. Apply glue along the 4 sides of your wax paper and lay your second sheet of wax paper on top of the first sandwiching the tissue hearts between the 2 sheets of wax paper. Using a glue stick, apply glue to the top piece of wax paper being sure not to get any glue on the open heart area. * Lay your second frame on top of this and press down. You now have a Valentine sun catcher which will look wonderful when hung in the window. *Hint - If your hearts don't line up correctly, flip the second frame over before gluing it onto your project. Optional: Once finished - before hanging up - outline your heart on one side with glitter glue. Lay flat and dry completely before hanging.